These are a few of the available Ukulele Clinics and Workshops that can be presented at your club event, festival, music store or social event. All workshops include professional prepared material and handouts. I have presented these and other workshops at various ukulele festivals across the country over the past several years, since 2004. These workshops are also presented at Funky Frets music store in Boyertown, USA several times a year. 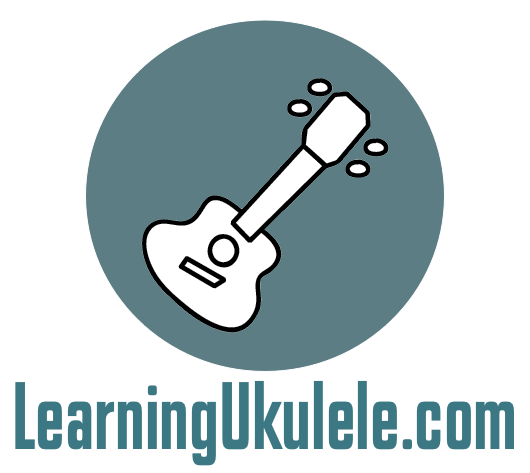 As you might guess from the massive number and wide range of topics and lessons covered on LearningUkulele.com I (Curt Sheller) can pretty much put together a great workshop for you from a wide range of topics. Any workshop can be customized to your particular needs. Where Do I Start? - This is a common question and this workshop addresses that very question. Getting Started - A Recipe for Success covers ukulele tunings, learning the ukulele fingerboard, basic chords and strums. 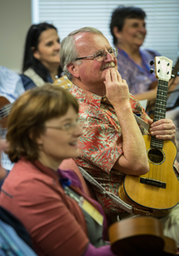 This workshop gets you rolling on having some fun playing the ukulele and we throw in a bit of ukulele history and fun facts as we explore the ukulele. This is actually a good workshop for any level player to gain some insight in organizing and even presenting their own workshops. Check the Funky Frets Meetup site for details and most up-to-date schedule on this workshop presented at Funky Frets Music Store, Boyertown, PA USA. Don't know what to play? 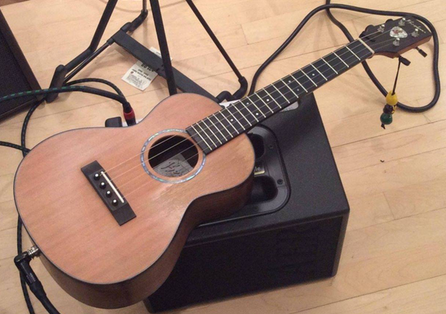 Tired of playing the same old down-up-down-up strums? One of the first skills a ukulele player learns is the art and craft of strumming, playing rhythm. This refers to an accompaniment technique suitable for the singer - songwriter or someone who plays a support role for another instrument. Strumming requires a specific set of skills. They are: 1) Memorization of chords 2) The ability to switch chords smoothly and 3) The ability to choose and execute a suitable rhythmic strum. It is this 3rd skill that is our focus in A Guide to Ukulele Strums. Though strumming looks natural to the casual observer, it is anything but natural to the beginning ukulele player. Even experienced players have difficulty in identifying and executing certain strums. Though this is one of those topics that is typically taken for granted, there is much to learn about rhythmic feels, accents, dynamics, strum direction, feel, percussive accents, idiomatic styles and tempo variation. Exploring Basic Fingerstyle on Ukulele. Classical and Alternating Thumb style fingerstyle technique applied to ukulele. This is now an entire series of lessons and book dedicated to exploring fingerpicking on ukulele. 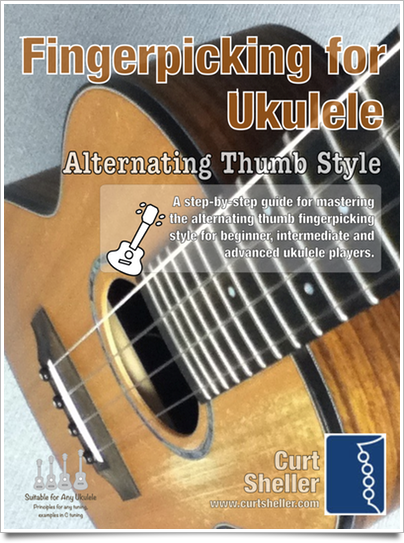 The first book in the series is for Alternating Thumb Fingerpicking style. A systematic approach cover ALL aspects of this style. Exploring contemporary 4-part, a.k.a. "Jazz" chord on ukulele all start with the Big Six, Core Chords. You most likely know the open position chords they're based on. From the Six core chords that are the Big Six and the principles of chord construction along with learning the notes of the ukulele fingerboard, you WILL be able to create ANY chord you come across just from the name. These jazz chords are simply 4-part contemporary chords that find their way in a lot of music - not just jazz. From these six chords you'll never be at a loss looking for that individual chord you need. Check the Funky Frets Meetup site for details and most up-to-date schedule. Tired of playing the same old songs and licks? Here is a workshop for any level ukulele player on creating fun stuff to play. Making you own music, taking what you already know and creating music. From a few SIMPLE chords and a few single notes you can create music and entertain yourself for hours. You actually know more than you think!!! This is my road to “Hours of Ukulele Fun” workshop. Building Left Hand Technique - Learn what it takes to build killer left hand chops on the ukulele. Single string left hand technique, open string, repeated notes, variations, intervals, double stops, triple stops, chord switching, rhythmic variations, skipping strings, legato and staccato technique. You'll never be better than you what you can actually pull off what you want with your hands. And, luckily our left hand - ALL of our fingers can be trained to a pretty high level allowing you to pull off what you would like to do. Exploring the chords, notes, scales and feel of the Blues on ukulele. A Guide to Blues Chord Progressions for Ukulele from A to Z explores the “Blues” chord progressions. The Blues are at the heart of all American music. It has influenced Country, Rock, Folk, Jazz, Bluegrass and just about every form of American music we listen to today. Understanding Blues Chord Progressions for Ukulele takes you through what makes a blues progression a blues progression. Reading Music on the Ukulele - Learning to read standard music notation. It's a lot easier on the ukulele than most stringed instruments. Learning the Ukulele Fingerboard - It is astonishing that on any other instrument it would be silly and not accepted to not know the names of the notes and where they are on your own instrument. But - on the ukulele, guitar and most fretted instruments their players do not know the names intuitively - they can figure them out but that takes way too long. Granted it's not as easy as the piano where higher and lower notes move in one direction only, are color coded and even at different heights. Anyone after the first or second lesson can instantly name any key on the piano. On ukulele as well as the guitar there are duplicate notes - the same note on different strings and music can mover horizontally along a string as well as vertically across the strings. Make for a lot of flexibility for note choices and there in lies the problem - the choices. This workshop is guaranteed to take the mystery out of the ukulele fingerboard and have you a lot closer to actually knowing the name of every note on the fingerboard and instantly recall it. Memorizing the notes of the ukulele fingerboard is not as hard as one would think. Although there doesn't seem to be any pattern and the same letter can be found on every string. There is a systematic approach that can be used to help remember the notes. You'll get more out of actually knowing the names of the notes of the fingerboard than most things you have to memorize. It will actually cut out the number of shapes you have to memorize. Theory? - Not really theory, it's pretty much how music works. It's the Principles of Music. This workshop starts with the basic principles of music and builds on a that solid foundation. Chords - Names, building and where do they actually the actual notes come from. A guide to transferring the accumulated experience and knowledge gained as a guitar player to the ukulele. Covers chords, scales, reading and the three most common ukulele tunings. This workshop is for current and former guitar players discovering the ukulele for the first time or returning to the instrument. A Ukulele for Guitar Players clinic and/or workshop covers how you can relate you existing guitar knowledge of chords and scales on the guitar to the different sized ukuleles and tunings. You already know more about the ukulele than you think.